Introducing a new comfortable and stylish high quality leatherette seat covers set. Generally fits all cars with regular bucket seat with removable headrests. Note: this is not the OEM or custom made cover therefore it might not be an exact fit. Made with breathable leatherette material with imitate leather feeling and polyester fabric which can stretch to best fit the seats. Warm in the winter and cool in the summer. Machine washable with low tumble. Best recommend to be wash by hand. 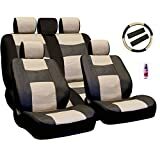 This set includes 2 front seat covers with separate head rest covers, rear bucket seat cover and 3 headrest covers, steering wheel cover and seat belt covers. This set also comes with a 2 oz travel size of the famous Water free Car Detailing. Purple Slice details your car with just 1 simple step, spray on, wait a few second and wipe it off with micro fiber cloth. You will notice in no time the shin and silky feeling Purple Slice provide. Front seat covers contains opening on the top for easy insert of headrest. Eye catching stylish design seat covers. Protects your car seats against daily wear.